Currently OnCue accepts .mdb ("Sanction") and OnCue .xml formats. 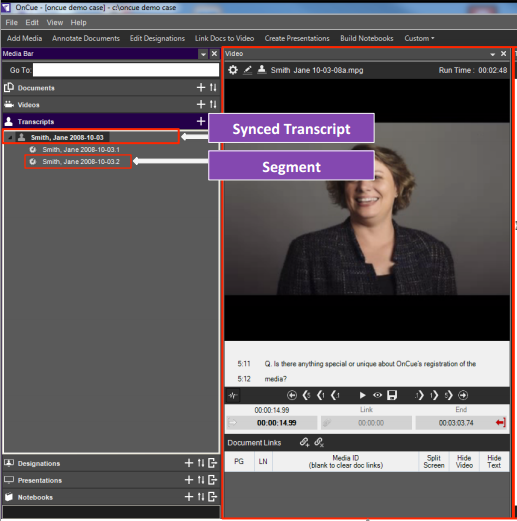 It is important to note that you DO NOT add the deposition video (mpg) files into OnCue, only the synch file (the .mdb or .xml). Another note on the actual video files: ALL corresponding synched mpg video files should then be copied to a single location: ideally the _synchedvideos folder inside the main OnCue folder because this is where OnCue will look for them. You can also put them in another desired folder outside of the main OnCue folder. If you choose to place them in an outside location, they can be manually mapped via Preferences. See Organizing Material and Data Paths. To import sync files, click on the + sign on the Transcripts drawer of the Media Bar, which will allow you to browse to and select your sync file(s). Now you will see the transcript registered under the Transcripts tab of the Media Bar. The transcript is named automatically based on the fields in the .mdb or .xml file for first name, last name and deposition date. If this data is incorrect, you can easily fix the ID and Name using the Properties Pane. Remember, OnCue will not know where the actual video is until it's been copied to the _synchedvideos folder, or you've mapped to them in Preferences. Again, see Organizing Material and Data Paths.